No, I did not just join twitter. 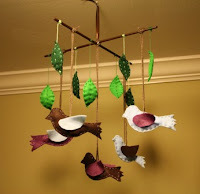 However, another bird themed project I have been working on is a mobile for my sister's baby girl (due April 22!). I found this tutorial on line and liked the pattern so it was a good starting point. I bought felt squares at Joann's Fabric for $0.29 each (one of each: blue, purple, brown, green, light green). I bought embroidery floss in blue, purple, green, and light green ($0.33 each). Unlike the tutorial, both sides of my birds were the same color, and rather than gluing the felt I hand stitched it with the corresponding color floss. Once I was almost around on the stitching I stuffed in some of the felt scraps to make the birds more 3D and then closed it up. I glued the wings just along the bottom so that they would sort of flap back. I also cut a pattern for leaves and sewed with the opposite green floss (didn't stuff those) leaving a long strand at the end to hang. Instead of a branch I had a thin dowel from Home Depot (under $1), and painted it with brown acrylic. I secured the dowel it to itself with thin wire, but hemp or twine would also work. When I assembled it I did it while it was hanging so that I could get it to balance correctly since not all the birds are at the same height. I used brown yarn for the bird strings. Sliding the leaves around also helped me achieve balance. Strictly following the tutorial probably would have only taken about 30 minutes. Since I hand stitched it, added leaves, and painted a dowel it took me about 3 hours but it felt shorter than that. It was super easy to make, and I love how it turned out. Now I'm pondering making a few more for other babies I know, and scheming some more designs. That is adorable! I am always jealous of people that are crafty.